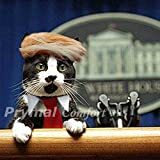 ★ This furry pet wig and tie, turns your cat into the President! ★ Fits most average size cats and small dogs. ★ Collar and tie attaches with velcro. If your little house cat acts like the king of the house, then you may as well make him the President of the house!! Trump Cat will make your house great again!